Nevertheless, there are various measures we can investigate that can at least give us some insights into how living standards have changed in recent decades. One of thess is “living space.” That is, how much space does each person have in his home for daily activities? It’s not enough to just look at the size of houses. We all know on some fundamental level that if 4 or 5 people must share a single bedroom in a home that this is a very different standard of living than if only 1 or 2 people do the same. Moreover, if 6 people are sharing a 1,000 sq foot home, that is a different standard of living than if 2 or 3 people are sharing a home of the same size. 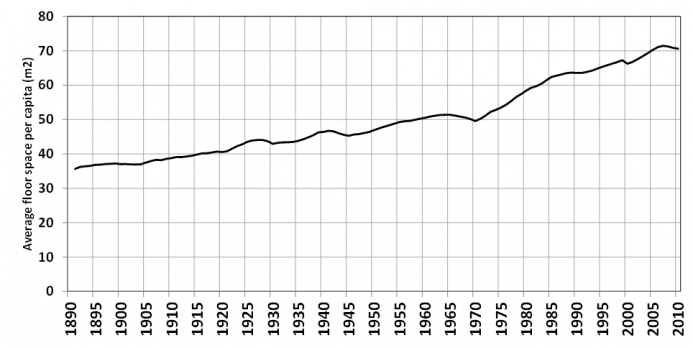 So, is there more living space per person in America today than in the past? In the article “120 Years of U.S. Residential Housing Stock and Floor Space,” researchers Maria Cecilia P. Moura, Steven J. Smith, and David B. Belzer analyze the housing stock available in the US and compare to total population and household size in the United States since 1890. From 1890 to the housing bust in 2007, average floor space per capita increased significantly from approximately 35 square meters (376 sq. feet) in 1890 to more than 70 square meters (753 sq. feet) in 2007. This was due to both a small increase in the size of housing units over this period, and to a much larger decrease in household size. From 1890 to 2010, the household size was cut in half from more than 5 in the 1890s to approximately 2.5 in recent years. More recent annual data from the census bureau shows household size has dropped from 3.3 in 1961 to 2.5 in 2017.2 While household size decreased, “the overall average floor space for units of all building types increased by 13% in the last 30 years, reaching almost 1,800 square feet per unit in 2010,” according to Moura, et al. Thanks to globalization, industrialization, and sizable increases in worker productivity, we’d expect to see an overall increase in the standard of living as expressed in living space. We have seen gains in terms of real incomes and in terms of amenities enjoyed by a large number of households. Not only did the housing size increase during this period, but houses contain many amenities they did not before, such as refrigerators, air conditioners, and dishwashers. Air conditioners, for example, were in only 50 percent of homes in the 1970s, but are in 87 percent of homes today. If we compare living standards today to those of 50 or 100 years ago, we see obvious improvements. But what if we compare to ten years ago or 20 years ago? Can we see similar trends? Put another way: your housing is better than than what your grandfather had, but how does your housing measure up to your father’s? On the matter of square footage, if we look to recent construction of homes, it still looks like Americans are enjoying more living space. There’s no reason to believe that Americans are now squeezing into smaller housing units, even when compared to housing of just one generation ago. For example, while newly constructed single-family homes did get smaller in the wake of the financial crisis, the decline reversed by 2013, and new single-family homes by 2015 were larger than they’d ever been before. 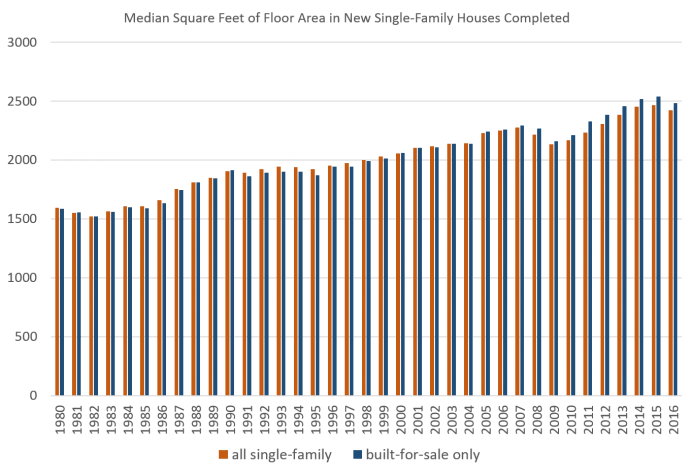 As the graph shows, new single-family homes are now considerably larger than they were in the 1980s. In 1985, for example, new homes reached a median size of 1,590 square feet. In 2016, that number was 2,482 square feet. 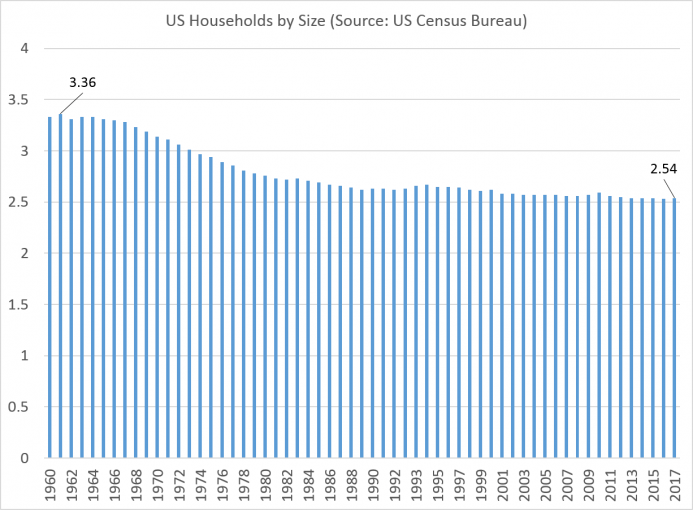 Also keep in mind that during this period, household size was also getting slightly smaller in the United States. That number includes condos and for-sale multifamily. 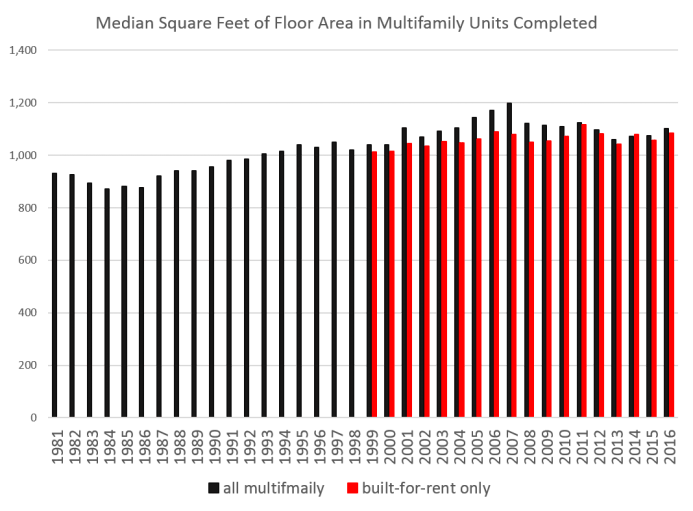 Data on for-rent multifamily units specifically is harder to find, but as the graph suggests, for-rent units aren’t all that different from condos. Note, also, that where possible I’ve stuck to median numbers and not averages. This is so our numbers aren’t heavily skewed by a small number of enormous mansions being built by the super-rich. Indeed, we can see growth is not being driven by the super-rich and mega-sized houses and condos if we break out the new units by size. There has been an increase in the number of larger units as a percentage of all units. However, a sizable portion of new units continue to be under 1,200 square feet in multifamily housing5. 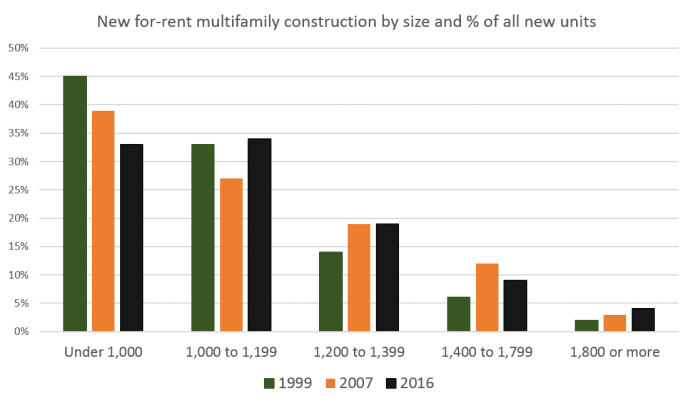 Large rental units over 1,800 square feet have doubled from two percent to four percent since 1999, but still only make up a small portion of all units. 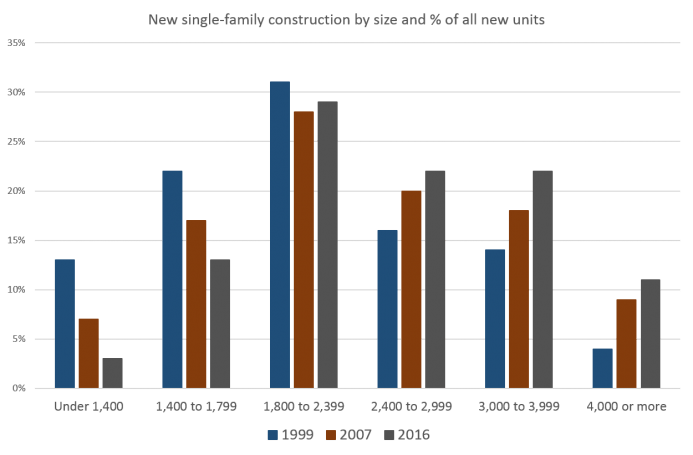 With single-family housing, though, there has been a more noticeable shift toward larger units.6 New homes built at under 1,400 square feet are quickly disappearing, and fell from 13% of all new units in 1999 to only 3% in 2016. We can contrast this with single-family homes of 4,000 square feet or more which increased from 4% to 11% of all new units from 1999 to 2016. While there has definitely been a shift toward larger single-family homes, mid-sized homes are hardly disappearing. When we combine these observations with those of Moura, et al, we see a picture of sustained growth in housing size over the past generation. Moreover, this growth has even continued over the past fifteen years, although some metrics show stagnating incomes over that time. Is Housing Is Unaffordable, Why Do Homes Keep Getting Bigger? This information all suggests something of a conundrum. We’re often being told that housing is becoming unaffordable, and Americans are too deeply in debt. If that’s the case, though, then why do houses keep getting bigger? After all, if Americans are getting squeezed on housing, shouldn’t consumers be demanding smaller and more economical living spaces? That is indeed what tends to happen during recessions and immediately following financial crises. We saw it during the Great Depression, we saw it during the recessions of the early 1980s, and we say it in the wake of the 2008 financial crisis. It’s true that new multifamily production hasn’t returned to its former peak in terms of unit size, but new housing size overall hasn’t even fallen back to 1990s levels. And the 90s wasn’t exactly a period of austerity. One possible explanation can be found in the fact that Americans are apparently happy to go into debt to avoid having to scale back on square footage. As recent data from the Fed has shown, mortgage debt in America is now only 4 percent below its sizable 2008 peak, and is rapidly heading toward its old peak levels reached right before the financial crisis. Total household debt has climbed to record levels. Thanks to low, low interest rates, Americans — faced with either buying a smaller house of going into debt — are apparently willing to take on more debt. At the same time, developers continue to build apartment building with larger units — convinced that the new units will find renters. Given relatively low vacancy rates for rental housing in recent quarters, they appear to be right. At what point, though, will rising housing costs lead to a real decline in the size of houses and apartments? In 2017, mortgage payments as a percentage of income hit a seven-year high. Data suggests that housing costs proportional to household costs and income has been hitting new highs in various income groups since 2014. Not surprisingly, lower-income households have gotten the worst of this. But when we look at most renters and homebuyers today, they’re living in larger units than did their parents a generation ago. There are hints that this trend may be at least temporarily slowing down. The most recent numbers for 2016 show that square footage in new homes went down slightly. And multifamily units are now largely flat in terms of size. It’s possible this points toward the limits of taking on more and more debt. And it may also point toward stagnation in real incomes. Moreover, a new recession would very likely send many people scrambling to economize on housing. For now, though, it looks like many Americans are still living large when it comes to housing. It’s true that housing costs are increasing — but in many cases, people are paying more for more housing. 1. The very issue of deciding what makes one “better off” is a matter of debate. For some people, more leisure time might be preferable to a larger house. 3. Historical multifamily data is compiled from here: (https://www.census.gov/construction/chars/mfu.html) and from older “Charateristics of New Housing” reports from the Census Bureau. 4. The longer term trend will only be reinforced by the short term trend of continued growth in new units. Over time, it is older, smaller houses and units that tend to be demolished, further pushing up median unit and home sizes. 5. https://www.census.gov/construction/chars/mfu.html The graph shows how many units of each size group are produced as a proportion of all new units.